When it came time to decide how we'd spend our first Christmas and New Years in Asia, China was the last place on my mind. I was chomping at the bit for a tropical vacation and my heart was set on Thailand, a destination that's been collecting dust on my travel bucket list for years. Sadly, my winter dreams of balmy Thai beaches were shattered when I discovered that accommodation rates in southeast Asia triple their average cost during the holidays. David and I agreed to save Thailand for the spring, and began searching for an off-season (read: affordable) location to welcome in the new year. Winters in northern China are frigid, making December and January ideal times to visit if you're looking for low prices and crowd-free sightseeing. We decided to embrace the bone-chilling winds and embarked on an 11-day journey through mainland China, kicking off in Shanghai. My first thoughts upon landing in Shanghai were: It's big - and loud. Something about its scale and noise made Shanghai seem less foreign than our miniature-sized, order-loving Tokyo. Of course, this ease quickly turned to panic after we'd spent about 15 minutes in the taxi to our hotel. Drivers were weaving in and out of traffic with their hand never - and I mean never - leaving the horn. Intersections were a complete free-for-all with cyclists, motor bikes, cars and trucks all competing to get ahead. But, despite my constant fear, I couldn't get enough of Shanghai's streets. I never tired of watching the bikes - mostly old, rusted and entirely overloaded with cargo - whiz through the gridlock. It was complete disorder, but somehow it all just worked. Shanghai is an enchanting mix of old and new, east and west. 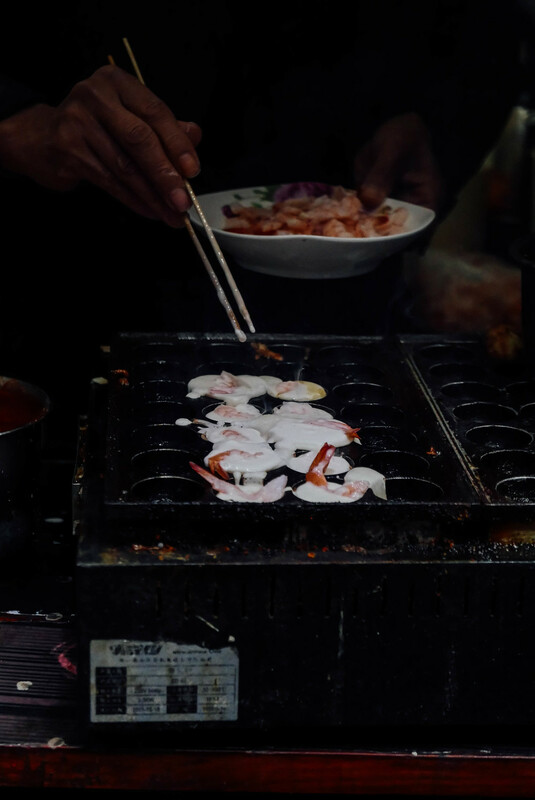 While it lacks the heavy-hitting tourist attractions you'll find in Beijing, its delectable eats are worth the trip alone. Its picturesque neighborhoods simply beg for wandering, and you'd be hard pressed to find another city with such a unique blend of architectural influences. Before I knew it, I was completely smitten with Shanghai - and our 'Plan B' destination became one of my favorite cities. We chose The Waterhouse at South Bund as our jumping off point, a converted warehouse located at the southern tip of Shanghai's popular waterfront. We loved the hotel's sleek minimalist design and spacious rooms. The staff was very helpful and even accommodated us when we arrived late on Christmas Eve and requested to order à la carte during their fixed menu holiday dinner. Our daily rate included breakfast, and while the buffet offering was nothing to write home about, it got the job done. If you visit during warmer months, the hotel has a rooftop bar with views of the colorful Pudong skyline. Escape the frantic city streets in a 16th-century traditional garden. The YuYuan Garden has ornate halls and pavilions, waterways teeming with carp and lots of curious rockeries. I found it beautiful even in December, when most of the garden's vegetation had long since shed its leaves for winter. The Yu Bazaar that surrounds the garden is a tourist trap, but worth a gander nonetheless. Get your Instagram shot of the infamous Pudong skyline from The Bund. The historic Western-style buildings lining Zhongshan Road (aka, The Bund) on the Huangpu River's east bank sit in stark contrast to the futuristic steel skyscrapers of neighboring Pudong. A vista that's worth visiting both during the day and again at nightfall. Explore the charming streets of the old French Concession. You can easily spend a full day getting lost in the labyrinth of stone alleyways that make up Tianzifang, a former residential neighborhood of shikumen (stone-gated) homes. These traditional symbols of Shanghai architecture have been converted to artsy boutiques, galleries, cafes and bars. Directly north, you'll find Xintiandi, a redeveloped area of the French Concession with upscale shopping and restaurants. Both are great destinations for long, leisurely meals and treasure hunting. Sip on some of the world's best tea. Shanghai is known to produce many of the finest tea leaves on earth, and there's no shortage of tea houses or shops where you can to sample them. We popped into Yan Le Cha Ji in Tianzifang, where a store associate prepared several different tea varieties for us to taste. When we decided on jasmine (along with a red clay tea set! ), he taught us how to properly brew the tea at home. Step inside the life of Shanghainese during the '20's and '30's. The Shikumen Open House Museum is a well-preserved shikumen (stone-gated) home that is open to the public and decorated with period furniture. I found the history of the shikumen and revitalization of the Xintiandi area really interesting. This museum will only take about 30 minutes of your time and is worth a stop on your tour of the former French Concession. Get an education in Chinese political history. The Propaganda Poster Art Center may be a little difficult to find, but it's worth the effort. Located in the basement of a residential building, this private museum holds over 6,000 propaganda posters dating back as far as 1940, providing a unique look into 20th-century Chinese history and the rise of communism under Chairman Mao. When you've arrived at the street address for the museum, approach the security guard at the parking entrance for detailed directions on the museum's location. Southern Barbarian for an introduction to the eclectic Yunnan cuisine of southwestern China. Favorite dishes included the Fried Goat Cheese, Crispy Shredded Potato Pancake and Pineapple Chicken. If you're a brew lover, don't miss their impressive beer list with 80+ offerings. I wasn't able to find a website for this restaurant, and the actual location itself is a little difficult to find. You'll walk through a building and into a courtyard, where Southern Barbarian can be found on the second floor. If all else fails, do what we did and ask a greeter at a nearby restaurant to point you in the right direction. Sichuan Citizen for fiery Sichuan dishes and inventive cocktails. Order their delicious basil drop martini to take the edge off your chili-laden meal. The Kung Pao Chicken is a must. Din Tai Fung for life-changing dumplings. It would be criminal to visit Shanghai and not eat XiaoLongBao! We dined at the trendy Xintiandi location of this Taiwanese chain, which earned a Michelin star for its Hong Kong branch. Take a number, grab a seat and ponder the menu while you wait. In addition to the necessary XiaoLongBao, we couldn't get enough of the Steamed Pork Buns, Vegetable and Ground Pork Wontons with House Special Spicy Sauce and Sautéed Greens with Garlic. Hakkasan for fine-dining Cantonese cuisine. We ate here on Christmas and enjoyed the Caramelized Pork Belly, Crispy Prawn with Dried Chili and Cashew Nuts and the Sanpei Chicken Claypot with Sweet Basil, Chili and Green Onion. Situated on the Bund, this restaurant is a great place to begin your night before heading to a nearby rooftop bar. Bar Rouge for an open-air rooftop that puts you front and center for the Pudong light show. It's nightclub atmosphere wasn't really to my liking, but you can't beat their view paired with a glass of bubbly. If you ever tire of Chinese food (which is unlikely), head over to Yongkang Road. This lively little street has a wide range of restaurants serving up Western fare. We popped into the cozy wine bar Le Cafe des Stagiaires for a glass of vino during our trip. Instagram, Facebook and Google are blocked in mainland China. This includes Gmail and Google maps! If you're like me and can't function without these sites, plan on bringing a VPN-enabled device with you. We use Unblock-Us, which has a free one-week trial. Avoid tap water and stick to bottled. Restaurants will serve your water hot - an indication that its clean! English communication will be very difficult. If you're traveling by cab in the city, be sure to have your destination written down in Mandarin for the driver - most front desk hotel employees will be happy to do this for you. Alternatively, you can print out address cards in advance of your trip on sites like City Weekend, Smart Shanghai and Time Out Shanghai. And don't be afraid of the subway - it's easy to navigate with plenty of English signage. Learn a few Chinese phrases to make your life easier. The ones we used most were Xie Xie (thank you - pronounced like she-she), Ni Hao (hello), Wo Bu Yao Le (I don't want) and Mai Dan (bill please). Note: This travel guide is available as a GPS-enabled map with offline navigation. Click here to download the guide and receive turn-by-turn walking directions between sights - no data plan or WIFI required! The prettiest tourist trap there ever was: Yu Bazaar. Entering the serene Yu Garden. Scenes from a Chinese garden. Inside one of the garden's many halls. Shanghai's garbage collectors are - of course - on bikes. The (smoggy) view from the Bund. Crispy prawn for Christmas dinner at Hakkasan. A full moon over the Oriental Pearl Tower. Learning the proper way to make jasmine tea. I took enough feline photos to start a 'Cats of China" coffee table book. Shanghai in a nutshell: motorbikes and traffic jams. The crispy shredded potato pancake at Southern Barbarian. Have you been to Shanghai? Any tips for my next visit?